poisons and dangerous drugs for human consumption. Namely Heroin, Strychnine and Opium. 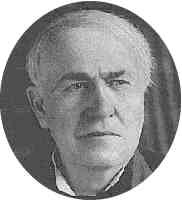 Edison had workshops at Menlo Park, New Jersey, from 1876 to 1886. ....Yet other visitors again haunted the place, and with the following reminiscence of one of them, from Mr. Edison himself, this part of the chapter must close: "At Menlo Park one cold winter night there came into the laboratory a strange man in a most pitiful condition. He was nearly frozen, and he asked if he might sit by the stove. In a few moments he asked for the head man, and I was brought forward. He had a head of abnormal size, with highly intellectual features and a very small and emaciated body. He said he was suffering very much, and asked if I had any morphine. As I had about everything in chemistry that could be bought, I told him I had. He requested that I give him some, so I got the morphine sulphate. He poured out enough to kill two men, when I told him that we didn't keep a hotel for suicides, and he had better cut the quantity down. He then bared his legs and arms, and they were literally pitted with scars, due to the use of hypodermic syringes. He said he had taken it for years, and it required a big dose to have any effect. I let him go ahead. In a short while he seemed like another man and began to tell stories, and there were about fifty of us who sat around listening until morning. He was a man of great intelligence and education. He said he was a Jew, but there was no distinctive feature to verify this assertion. He continued to stay around until he finished every combination of morphine with an acid that I had, probably ten ounces all told. Then he asked if he could have strychnine. I had an ounce of the sulphate. He took enough to kill a horse, and asserted it had as good an effect as morphine. When this was gone, the only thing I had left was a chunk of crude opium, perhaps two or three pounds. He chewed this up and disappeared. I was greatly disappointed, because I would have laid in another stock of morphine to keep him at the laboratory. About a week afterward he was found dead in a barn at Perth Amboy." The reader is left to ponder whether the poor man`s demise was related, in some way or an other, with his visit to Edison`s workshop. Should any doubt arise as to the authenticity of this text, the full book Edison, His Life and Inventions is in the public domain, and is available to view or download freely at many sites. Put the title into Google to find them. "One day while I was carrying on my work in Newark, a Wall Street broker came from the city and said he was tired of the `Street,' and wanted to go into something real. He said he had plenty of money. He wanted some kind of a job to keep his mind off Wall Street. So we gave him a job as a `mucker' in chemical experiments. The second night he was there he could not stand the long hours and fell asleep on a sofa. One of the boys took a bottle of bromine and opened it under the sofa. It floated up and produced a violent effect on the mucous membrane. The broker was taken with such a fit of coughing he burst a blood-vessel, and the man who let the bromine out got away and never came back. I suppose he thought there was going to be a death. But the broker lived, and left the next day; and I have never seen him since, either." "Another time we experimented with a tub full of soapy water, and put hydrogen into it to make large bubbles. One of the boys, who was washing bottles in the place, had read in some book that hydrogen was explosive, so he proceeded to blow the tub up. There was about four inches of soap in the bottom of the tub, fourteen inches high; and he filled it with soap bubbles up to the brim. Then he took a bamboo fish-pole, put a piece of paper at the end, and touched it off. It blew every window out of the place." "When I started at Menlo, I had an electric furnace for welding rare metals that I did not know about very clearly. I was in the dark-room, where I had a lot of chloride of sulphur, a very corrosive liquid. I did not know that it would decompose by water. I poured in a beakerful of water, and the whole thing exploded and threw a lot of it into my eyes. I ran to the hydrant, leaned over backward, opened my eyes, and ran the hydrant water right into them. But it was two weeks before I could see." "One afternoon, after our Pearl Street station started, a policeman rushed in and told us to send an electrician at once up to the corner of Ann and Nassau streets--some trouble. Another man and I went up. We found an immense crowd of men and boys there and in the adjoining streets--a perfect jam. There was a leak in one of our junction-boxes, and on account of the cellars extending under the street, the top soil had become insulated. Hence, by means of this leak powerful currents were passing through this thin layer of moist earth. When a horse went to pass over it he would get a very severe shock. When I arrived I saw coming along the street a ragman with a dilapidated old horse, and one of the boys told him to go over on the other side of the road--which was the place where the current leaked. When the rag- man heard this he took that side at once. The moment the horse struck the electrified soil he stood straight up in the air, and then reared again; and the crowd yelled, the policeman yelled; and the horse started to run away. This continued until the crowd got so serious that the policeman had to clear it out; and we were notified to cut the current off. We got a gang of men, cut the current off for several junction- boxes, and fixed the leak. One man who had seen it came to me next day and wanted me to put in apparatus for him at a place where they sold horses. He said he could make a fortune with it, because he could get old nags in there and make them act like thoroughbreds." "The next time we just saved ourselves. I was making some stuff to squirt into filaments for the incandescent lamp. I made about a pound of it. I had used ammonia and bromine. I did not know it at the time, but I had made bromide of nitrogen. I put the large bulk of it in three filters, and after it had been washed and all the water had come through the filter, I opened the three filters and laid them on a hot steam plate to dry with the stuff. While I and Mr. Sadler, one of my assistants, were working near it, there was a sudden flash of light, and a very smart explosion. I said to Sadler: `What is that?' `I don't know,' he said, and we paid no attention. In about half a minute there was a sharp concussion, and Sadler said: `See, it is that stuff on the steam plate.' I grabbed the whole thing and threw it in the sink, and poured water on it. I saved a little of it and found it was a terrific explosive. The reason why those little preliminary explosions took place was that a little had spattered out on the edge of the filter paper, and had dried first and exploded. Had the main body exploded there would have been nothing left of the laboratory I was working in." "At Menlo Park one day, a farmer came in and asked if I knew any way to kill potato- bugs. He had twenty acres of potatoes, and the vines were being destroyed. I sent men out and culled two quarts of bugs, and tried every chemical I had to destroy them. Bisulphide of carbon was found to do it instantly. I got a drum and went over to the potato farm and sprinkled it on the vines with a pot. Every bug dropped dead. The next morning the farmer came in very excited and reported that the stuff had killed the vines as well. I had to pay $300 for not experimenting properly." Such incidents brought out in narration the fact that many of the men working with him had been less fortunate, particularly those who had experimented with the Roentgen X-ray, whose ravages, like those of leprosy, were responsible for the mutilation and death of at least one expert assistant. In the early days of work on the incandescent lamp, also, there was considerable trouble with mercury. "I had a series of vacuum-pumps worked by mercury and used for exhausting experimental incandescent lamps. The main pipe, which was full of mercury, was about seven and one-half feet from the floor. Along the length of the pipe were outlets to which thick rubber tubing was connected, each tube to a pump. One day, while experimenting with the mercury pump, my assistant, an awkward country lad from a farm on Staten Island, who had adenoids in his nose and breathed through his mouth, which was always wide open, was looking up at this pipe, at a small leak of mercury, when the rubber tube came off and probably two pounds of mercury went into his mouth and down his throat, and got through his system somehow. In a short time he became salivated, and his teeth got loose. He went home, and shortly his mother appeared at the laboratory with a horsewhip, which she proposed to use on the proprietor. I was fortunately absent, and she was mollified somehow by my other assistants. I had given the boy considerable iodide of potassium to prevent salivation, but it did no good in this case." When Roentgen came forward with his discovery of the new "X"-ray in 1895, Edison was ready for it, and took up experimentation with it on a large scale; some of his work being recorded in an article in the Century Magazine of May, 1896, where a great deal of data may be found. Edison says with regard to this work: "When the X-ray came up, I made the first fluoroscope, using tungstate of calcium. I also found that this tungstate could be put into a vacuum chamber of glass and fused to the inner walls of the chamber; and if the X-ray electrodes were let into the glass chamber and a proper vacuum was attained, you could get a fluorescent lamp of several candle-power. I started in to make a number of these lamps, but I soon found that the X-ray had affected poisonously my assistant, Mr. Dally, so that his hair came out and his flesh commenced to ulcerate. I then concluded it would not do, and that it would not be a very popular kind of light; so I dropped it." "Some of my assistants in those days were very green in the business, as I did not care whether they had had any experience or not. I generally tried to turn them loose. One day I got a new man, and told him to conduct a certain experiment. He got a quart of ether and started to boil it over a naked flame. Of course it caught fire. The flame was about four feet in diameter and eleven feet high. We had to call out the fire department; and they came down and put a stream through the window. That let all the fumes and chemicals out and overcame the firemen; and there was the devil to pay." "When we first put the Pearl Street station in operation, in New York, we had cast-iron junction- boxes at the intersections of all the streets. One night, or about two o'clock in the morning, a policeman came in and said that something had exploded at the corner of William and Nassau streets. I happened to be in the station, and went out to see what it was. I found that the cover of the manhole, weighing about 200 pounds, had entirely disappeared, but everything inside was intact. It had even stripped some of the threads of the bolts, and we could never find that cover. I concluded it was either leakage of gas into the manhole, or else the acid used in pickling the casting had given off hydrogen, and air had leaked in, making an explosive mixture. As this was a pretty serious problem, and as we had a good many of the manholes, it worried me very much for fear that it would be repeated and the company might have to pay a lot of damages, especially in districts like that around William and Nassau, where there are a good many people about. If an explosion took place in the daytime it might lift a few of them up. However, I got around the difficulty by putting a little bottle of chloroform in each box, corked up, with a slight hole in the cork. The chloroform being volatile and very heavy, settled in the box and displaced all the air. I have never heard of an explosion in a manhole where this chloroform had been used." "When the first lamp-works were started at Menlo Park, one of my experiments seemed to show that hot mercury gave a better vacuum in the lamp than cold mercury. I thereupon started to heat it. Soon all the men got salivated, and things looked serious; but I found that in the mirror factories, where mercury was used extensively, the French Government made the giving of iodide of potassium compulsory to prevent salivation. I carried out this idea, and made every man take a dose every day, but there was great opposition, and hot mercury was finally abandoned." Through an introduction from Mr. Jay Gould, who then controlled the Union Pacific, Edison was allowed to ride on the cow-catchers of the locomotives. "The different engineers gave me a small cushion, and every day I rode in this manner, from Omaha to the Sacramento Valley, except through the snow-shed on the summit of the Sierras, without dust or anything else to obstruct the view. Only once was I in danger when the locomotive struck an animal about the size of a small cub bear--which I think was a badger. This animal struck the front of the locomotive just under the headlight with great violence, and was then thrown off by the rebound. I was sitting to one side grasping the angle brace, so no harm was done." "James Gordon Bennett came to me and asked that I try some primary experiments to see if aerial navigation was feasible with `heavier-than-air' machines. I got up a motor and put it on the scales and tried a large number of different things and contrivances connected to the motor, to see how it would lighten itself on the scales. I got some data and made up my mind that what was needed was a very powerful engine for its weight, in small compass. So I conceived of an engine employing guncotton. I took a lot of ticker paper tape, turned it into guncotton and got up an engine with an arrangement whereby I could feed this gun- cotton strip into the cylinder and explode it inside electrically. The feed took place between two copper rolls. The copper kept the temperature down, so that it could only explode up to the point where it was in contact with the feed rolls. It worked pretty well; but once the feed roll didn't save it, and the flame went through and exploded the whole roll and kicked up such a bad explosion I abandoned it. But the idea might be made to work." "I had read in a scientific paper the method of making nitroglycerine, and was so fired by the wonderful properties it was said to possess, that I determined to make some of the compound. We tested what we considered a very small quantity, but this produced such terrible and unexpected results that we became alarmed, the fact dawning upon us that we had a very large white elephant in our possession. At 6 A.M. I put the explosive into a sarsaparilla bottle, tied a string to it, wrapped it in a paper, and gently let it down into the sewer, corner of State and Washington Streets." I read Edison, His Life and Inventions for the first time on the 16th October 2003. I must admit to having a very strange feeling whilst reading it. The similarities between some aspects of Edison`s work and that of Ernest Glitch is uncanny. For those unaware of the Victorian Experimentalist Ernest Glitch, please peruse The Ernest Glitch Chronicles. I was completely unaware of Edison`s dangerous exploits and long suffering assistants when I wrote The Chronicles. It is indeed a fine example of the truth being stranger than fiction. "Oh, Diamond! Diamond! thou little knowest what mischief thou hast done!"